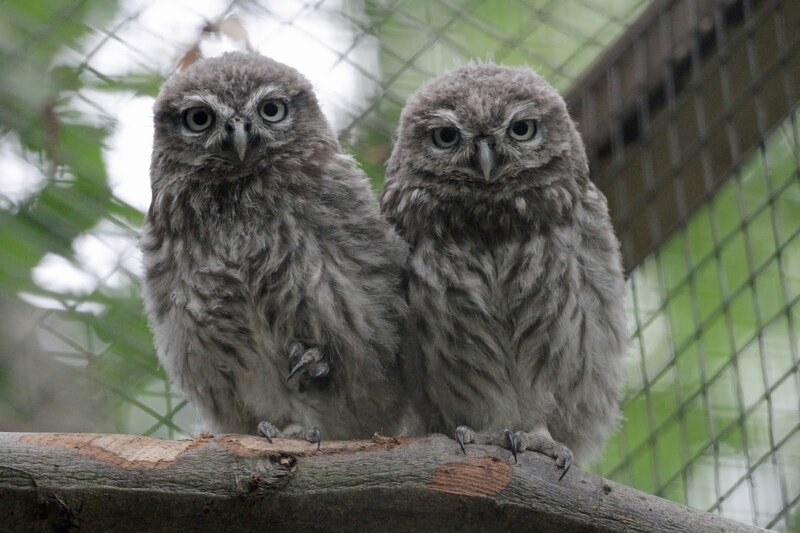 Wildwood has welcomed it's newest animals, a pair of young little owls. Little owls are Britain's smallest owl and at just over 20cm in length, are only half the size of a tawny owl, our most familiar species. The owls, a brother and sister, were found in a workshop and were the only surviving pair of their brood after their mother had sadly died. They were rescued by the owner of the workshop and brought to Wildwood where the keeper team have been taking care of them to build up their strength. The owls are in excellent health are now on public display, but won't be able to go back to the wild as after being hand-reared they won't be able to fend for themselves. The pair, now around 14 weeks old, have been named Tip-Ex and Bostik, after the Wildwood keepers had to mark one of the owl's claws with a spot of Tip-Ex in order to tell them apart. They are both doing very well and are settling into their enclosure, where visitors can see them as they practice flying from perch to perch. Little owls are just one of the huge range of British animals that can be seen at the Wildwood Wildlife Park, for more information visit the website at www.wildwoodtrust.org or telephone 0871 7820087. Wildwood is situated close to Canterbury, on the A291 between Herne Bay and Canterbury. For more information visit our website at www.wildwoodtrust.org or telephone 0871 782008.